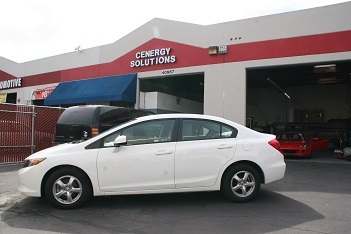 ANG home fueling from Cenergy Solutions. Adsorbed Natural/Bio Gas (ANG) technology creates an opportunity. This opportunity is to cost-effectively convert existing as well as new production passenger, SUV’s, light-duty vehicles, fleet trucks, heavy duty trucks and off road vehicles to CNG. Natural gas that is acquired from your home or business meter can be one third the cost of natural gas at CNG fueling stations and one fifth the cost of gasoline or diesel at gas stations. The lower cost of natural gas fueling at homes or business makes it prudent to convert to a bi-fuel vehicle. 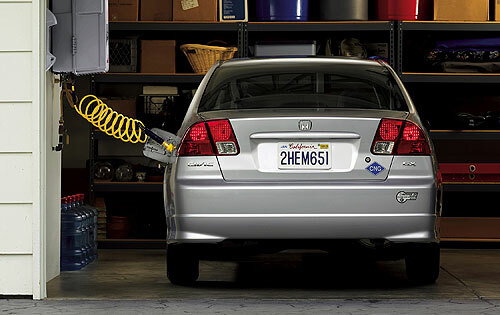 The automobile industry has said that the highest cost of a CNG filling station is the compressor. This is because compressing to 3,600 psi takes a tremendous amount of energy. By reducing that compression to 1,000 psi, or even further it enables home refueling. As a result, with home refueling you have 53 million potential fill points. Which would consist of every residence in the country that has natural gas running into it. Conformable, low pressure CNG storage solution is possible with ANG. ANG allows tanks to fit more easily into the architecture and design of existing vehicle platforms. This allows for full-scale, NGV hybrid deployment in the US as well as internationally. ANG home fueling requires lower-cost, less complex, and smaller compression equipment to pressurize natural gas to the required levels of 350-1000 psi to fill a low-pressure ANG tank. This makes affordable and reliable Home Refueling Appliance (HRA) a technological viable commercial reality. Several companies have affordable HRA prototypes. The prototypes will be rapidly commercialized which would effectively allow ANG home fueling equipped vehicles to conveniently and cheaply fill their tanks with clean natural gas at home. The combination of ANG tanks that lower both the cost of converting vehicles to CNG, and decreasing the cost of CNG refueling and infrastructure and equipment, makes converting higher MPG light-duty passenger vehicles to cleaner CNG an economic benefit for consumers and an environmental win for the world community. The lower pressures required to fill Cenergy’s ANG systems allow for the rapid growth of a natural gas refueling network. Significantly lower capital investment is needed since compressors no longer need to pressurize to 3,000 psi or 3,600 psi. With ANG’s lower pressure, CNG infrastructure will be more easily and cost-effectively added to truck stops. This creates a market for low-pressure CNG Home Refueling Appliances (HRA’s) allowing consumers to fill their vehicles at home. The lower cost of natural gas at home or business meters and the reduction in the cost of an expensive compressor will make it more affordable for individuals in the US and around the world to convert their vehicles to natural/bio gas systems on vehicles throughout the world.